Hello, and welcome back to our blog here at Computer Tutor Business And Technical Institute. 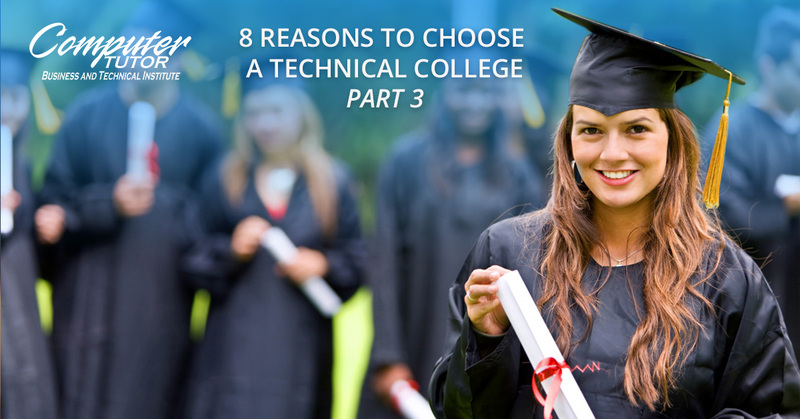 This is part three of our blog series about eight reasons why you should choose a technical college. Last time, we talked about the higher chance of graduating you will have at a career college, as well as our educators’ connection to companies throughout various industries. If you would like to learn more about these benefits, contact Computer Tutor Business And Technical Institute or keep reading our blog. In some cases, you will be able to transfer credits over to your technical university from other types of universities. Why does this matter? Because it gives you something to lay back on in case things don’t work out with your traditional university. This is not unusual as many students will start going to college only to drop out half way either due to poor grades or not enough funds to make it through. Student loans can get built up so much that it may not even be worth pursuing anymore. This is the time to consider a technical university because you’ll be able to get into the workforce more quickly and at a lower price point. Another thing many people don’t consider is the cost of student housing. Most universities require first-year students to live on campus for their first year. This can lead to a whole new financial load that could be avoided at a technical university where students can live at home throughout their entire education. At the end of the day, technical colleges are simply cheaper. This is in part due to the fact that they are shorter and cut a lot of the courses that you would be required to take at a traditional university. However, by semester, many technical schools are able to boast a cost of around 2,000 dollars whereas a four-year university can be around 15,000 dollars. This is a massive difference and should absolutely be taken into consideration when determining what career students want to pursue. Are you ready to finally take control of your education and your future? Whether you’re just graduating high school or you’ve been at a traditional four-year college, it’s never too late to consider or reconsider your options. Contact us today.